What a year it has been! 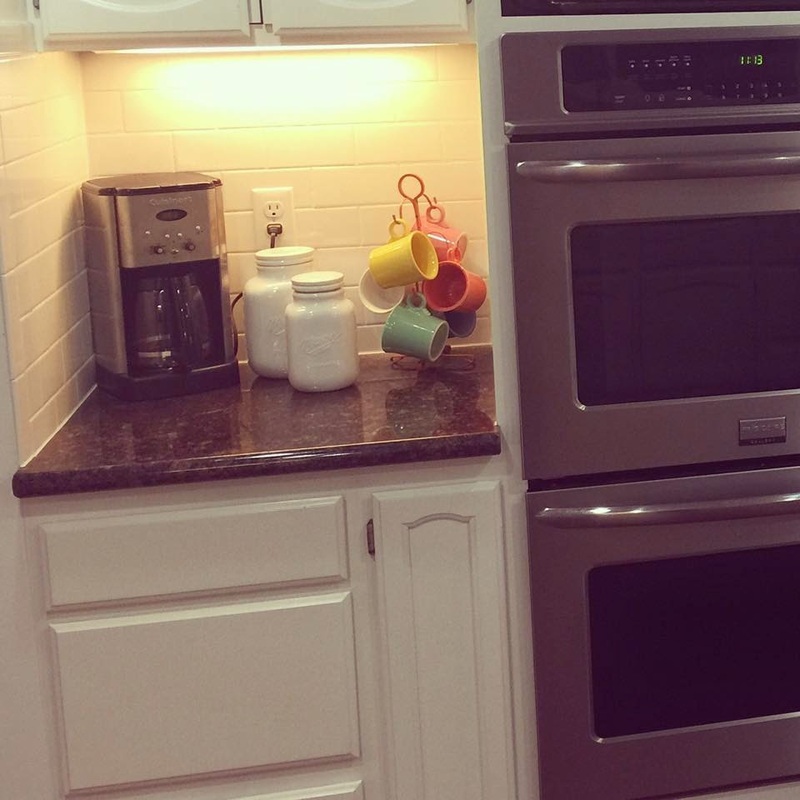 This kitchen has been the most fun and yet the hardest DIY yet. But it was absolutely worth every drop of blood, sweat and tears! Let’s go back to where it all started in 2006, when we purchased this house. 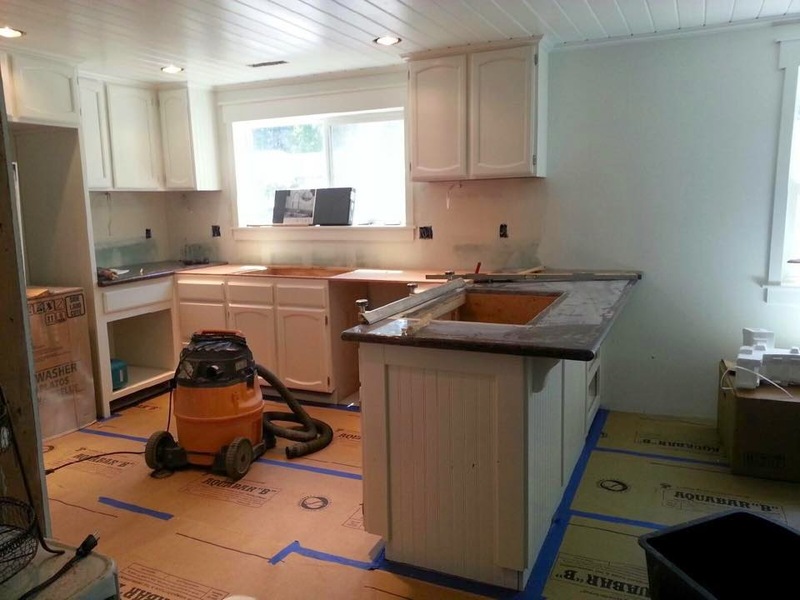 We had this wild and dumb idea to paint the cabinets brown….. DO NOT ask what we were thinking…… they didn’t last long, trust me! All I see when I look at these pictures is a crazy house with 3 children under the age of 4. I sure do miss those days though, I wont lie. The house was built in 1952, and trying to bring it into the 20th century to accommodate a family of 5 had plenty of it’s challenges. 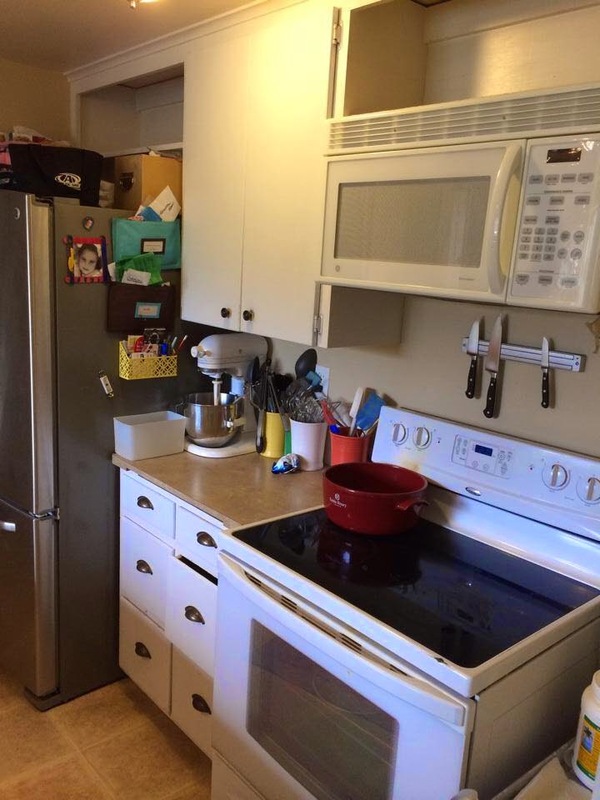 Sadly the house didn’t come with the original stove, so we had this really awkward space next to our stove, and later we made the decision to ad the over the range microwave to create space on the counter tops. This is the so called dining room, and as you can tell would NOT fit a table big enough for the family, so it really became a catch all area. Never my favorite place in the house. Here are a couple of later updated photos once we pulled our heads out of the clouds and realized the blue had to go! Speaking of 1952 modifications…. there was no dishwasher. 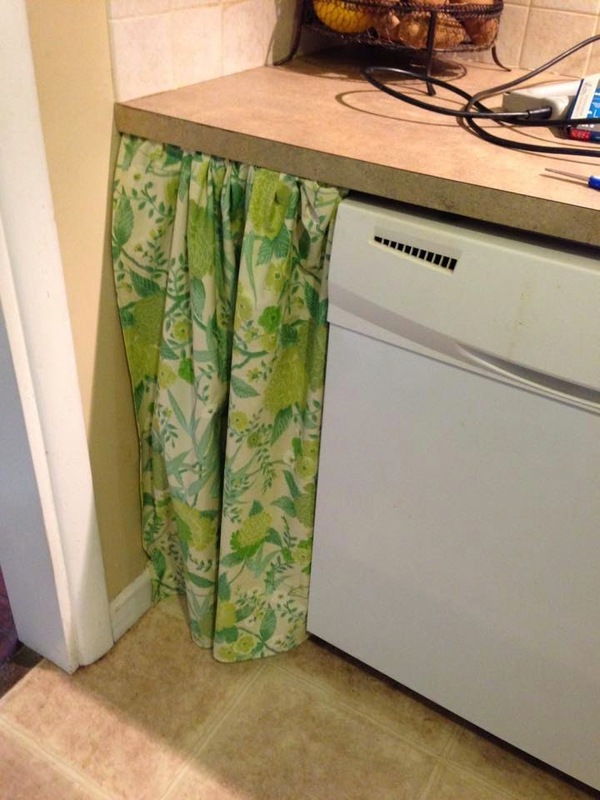 As a full time working family, we needed that dishwasher, and in an attempt to avoid building a new cabinet, I hung a curtain and hid my recycle bin there. Worked great for many years! 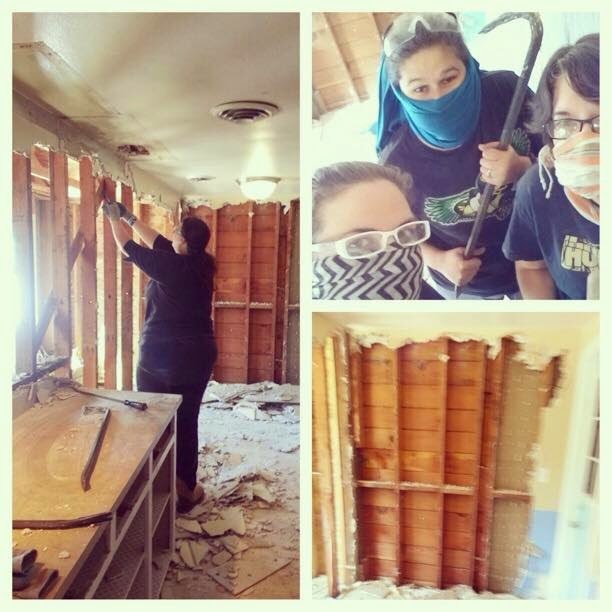 In April of 2014 our best friends from California came up to visit and help us get this kitchen project well underway! To be honest, the men were dragging their feet, so while they were off golfing, us ladies grabbed the tools and took her down! Talk about a fun workout! 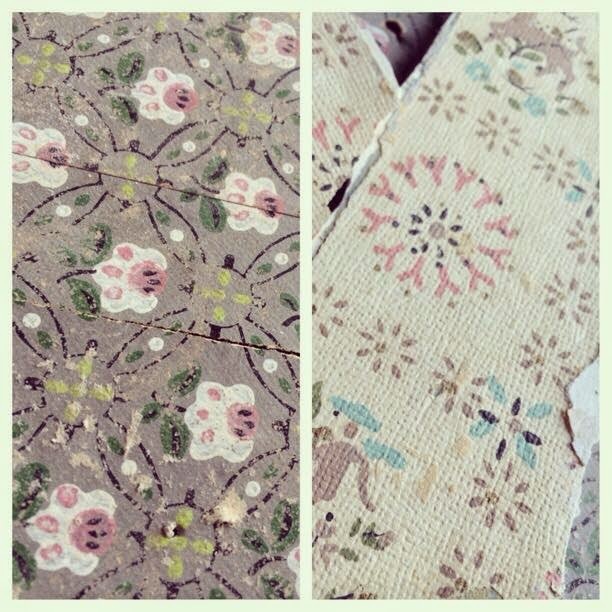 It was so much fun uncovering the original beauty. Under about 5 layers of paint and wood paneling, were these amazing wall papers. I wish there were some big chunks that I could have saved, but these pictures will have to do. 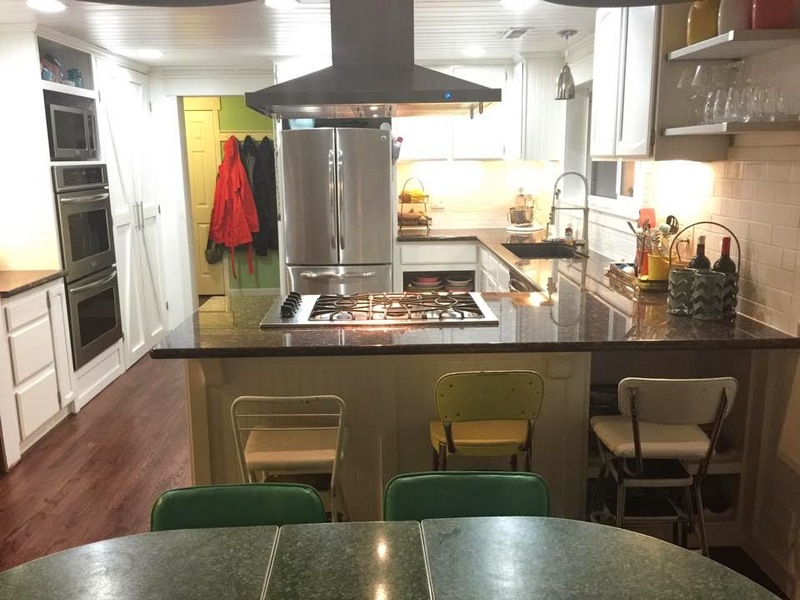 All I could do was think of how cheery it must have been in that brand new 1952 kitchen! All in a days work and we were left with this shell. We left the sink for washing hands and things like that. 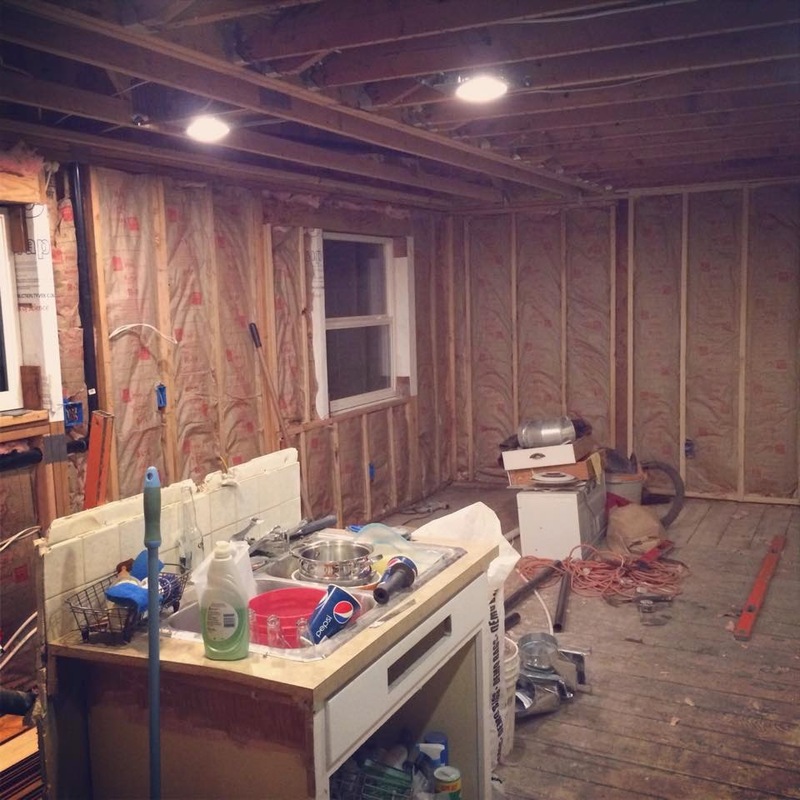 From there we put in the insulation and had our electrician install recessed lighting. 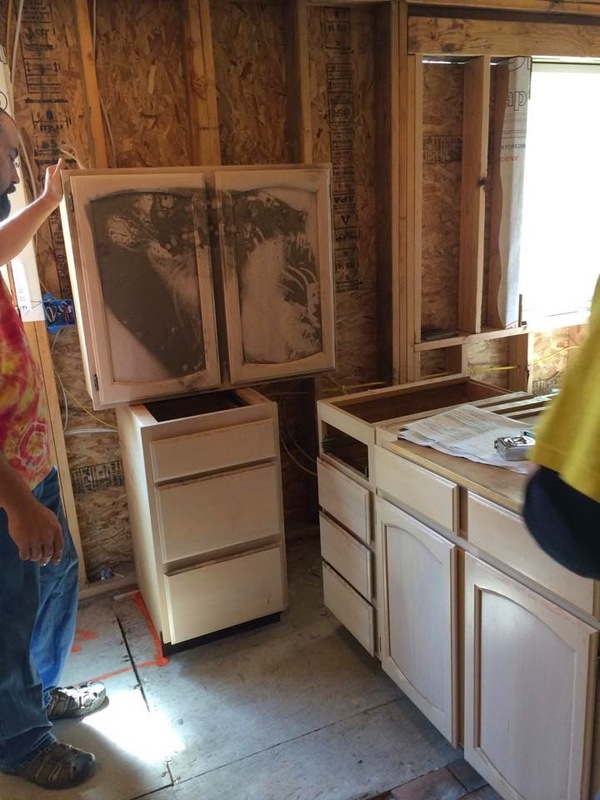 The guys brought in all of our cabinets from the shop and started to figure out the perfect layout in the kitchen. These are cabinets that we found on the side of the road for $100!! They are solid maple with great drawer slides and door hinges. This was a score, and I am so happy we kept them for so many years. Saved over $10,000 easily. 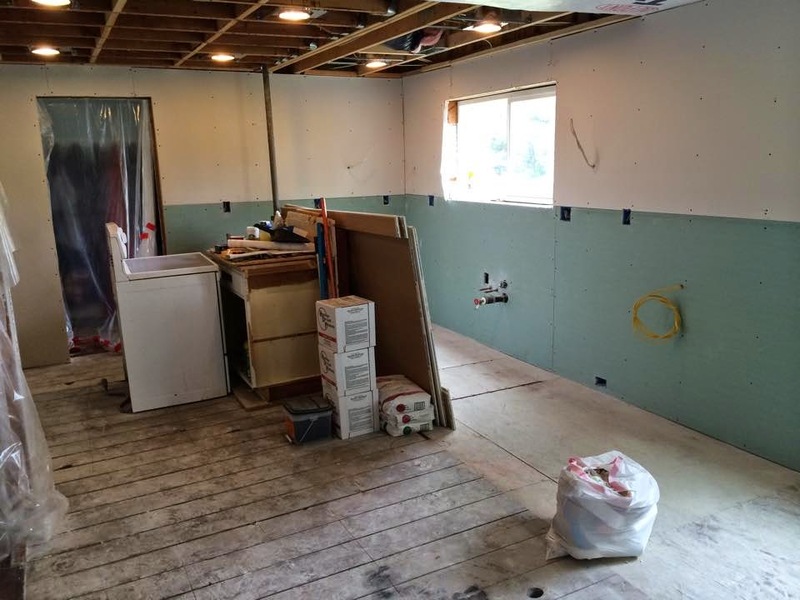 He hired out for the drywall, and he had this hung in one day, and mudded the following two days to allow enough dry time. 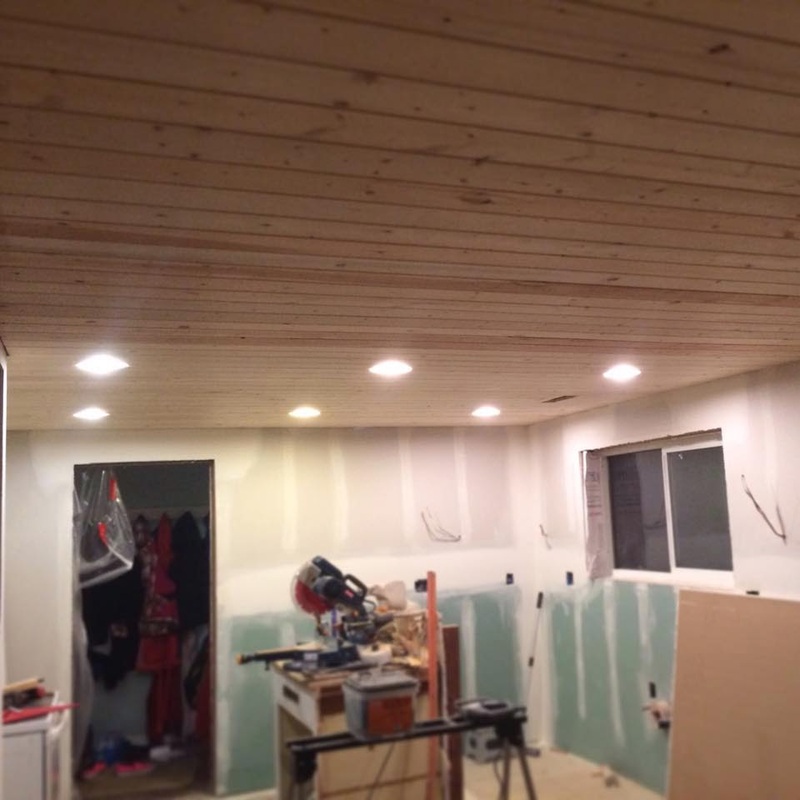 After the drywall was complete, we hung our pine tongue and groove planks on the ceiling. 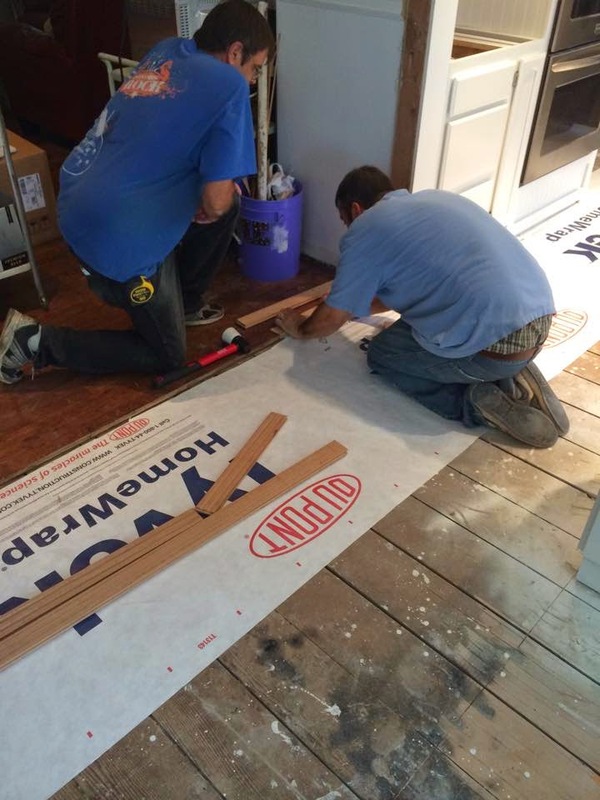 Before we could install the cabinets we had to make sure the floor was level. The downside to adding onto an older home is trying to get your foundations to match. 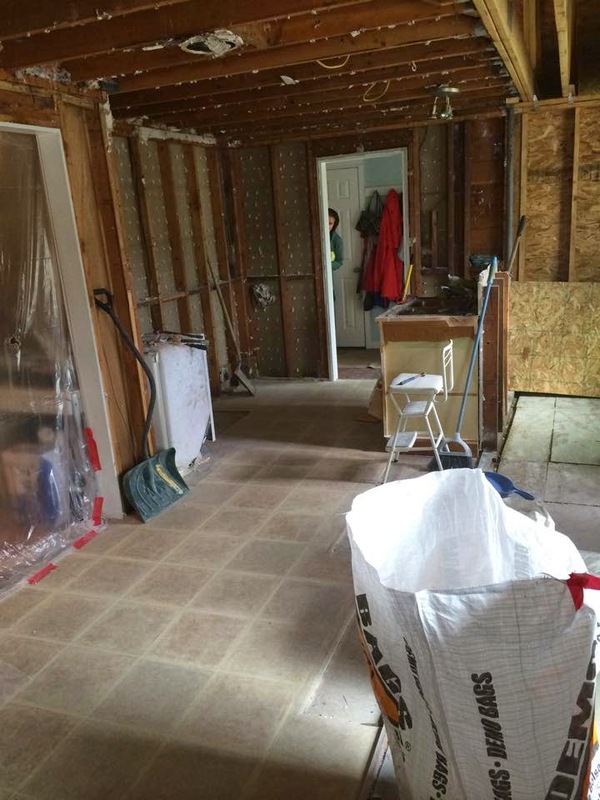 Over the years the house has settled, and here you can see where we had to plane down the existing sub floor to be level with the new space. We bought our very first Kreg product and built exactly what we wanted. 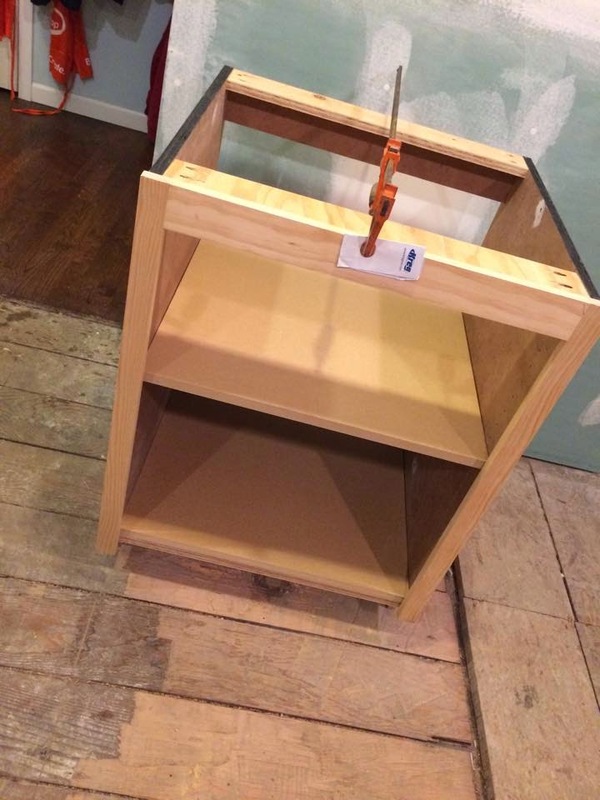 Open shelving base unit that cost us about $26 total, add in the cost of the tool and it was still only $126. BAM, saving money every step of the way! 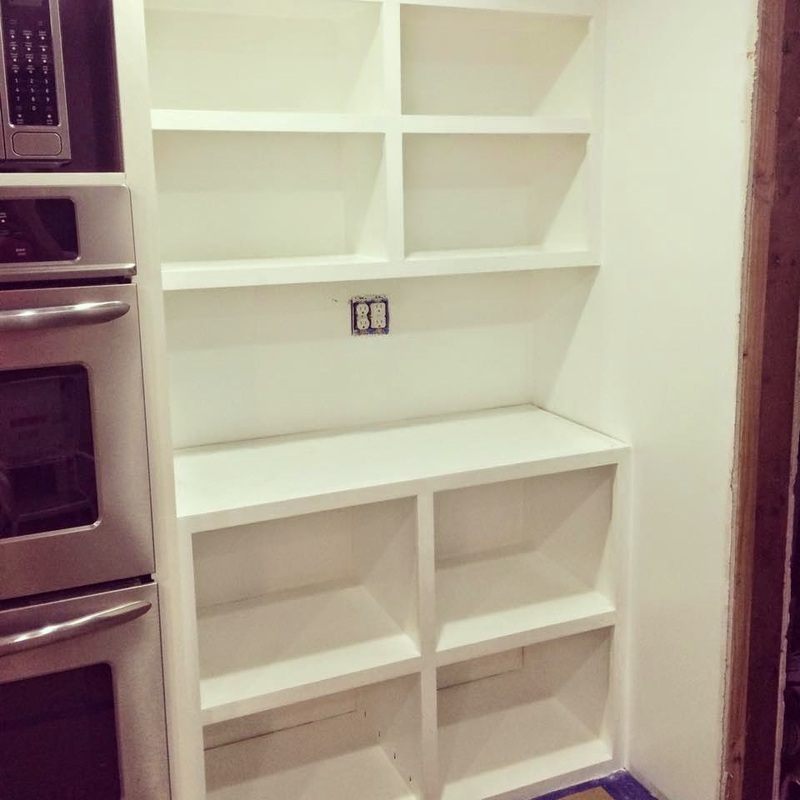 The guys (my husband, father in law and our friend from CA) spent hours installing the base cabinets and building the surrounds for the fridge and oven unit, making sure it was perfect. 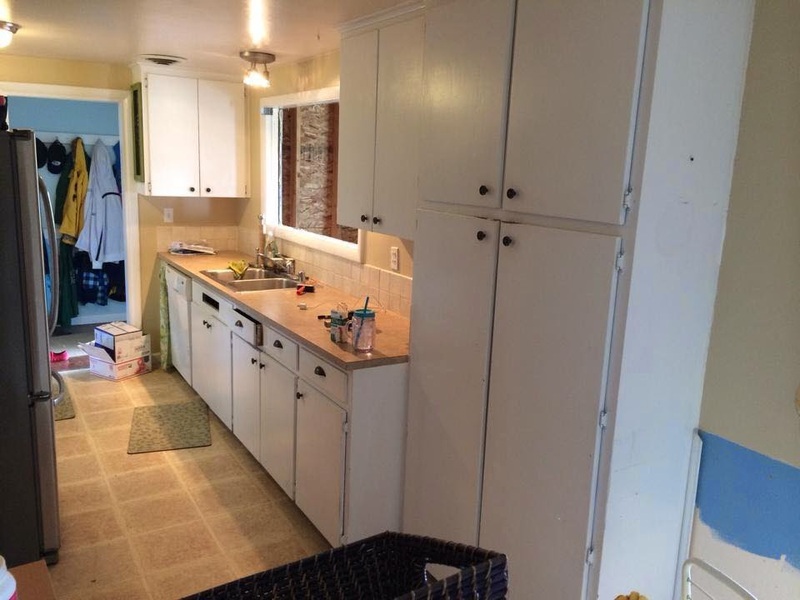 Notice what’s inside those cabinets?? Slide outs! I still can’t believe I paid $100 for all of these! 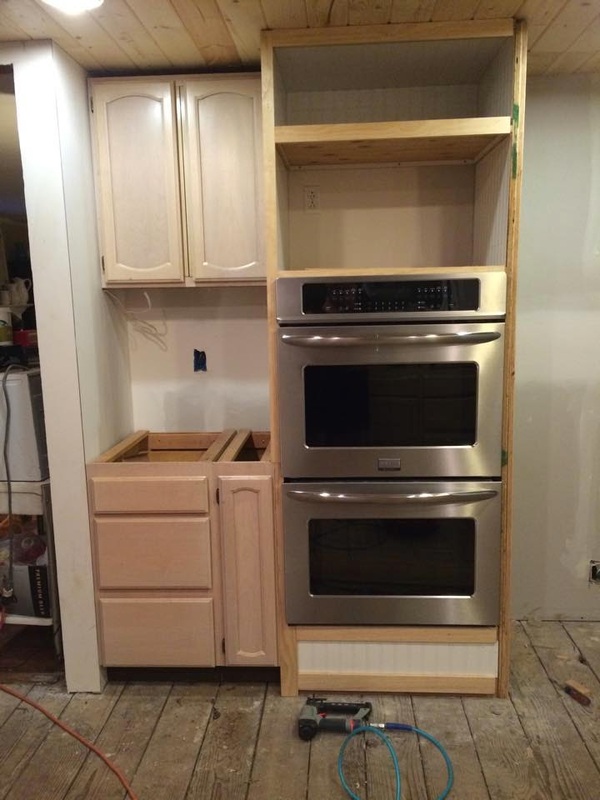 Here is the built in they designed for the ovens and microwave. 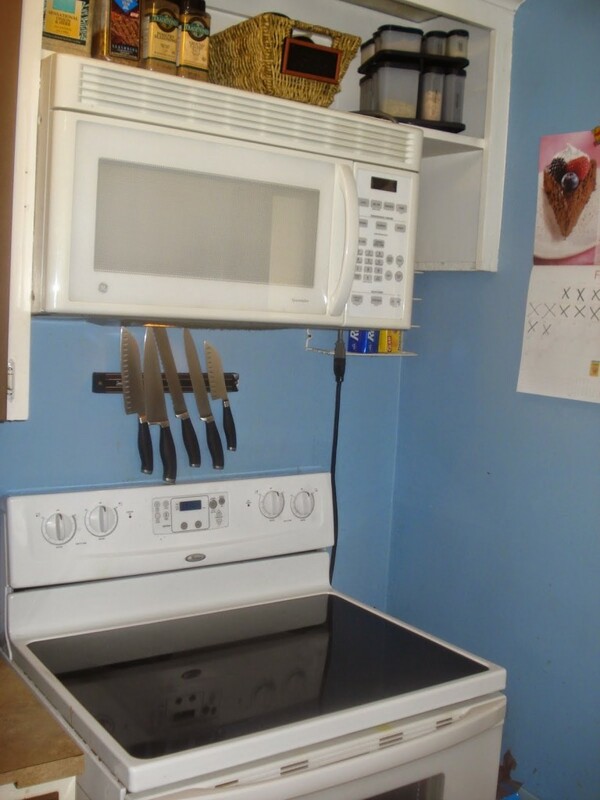 I remember coming home to this, and still could not believe I was going to finally have double ovens! 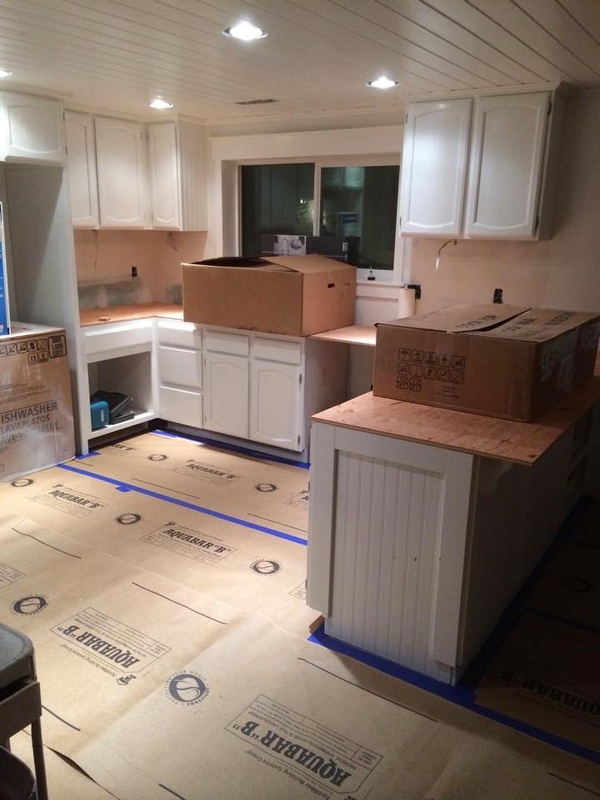 Once the cabinets were all installed, we spent hours on finish work. 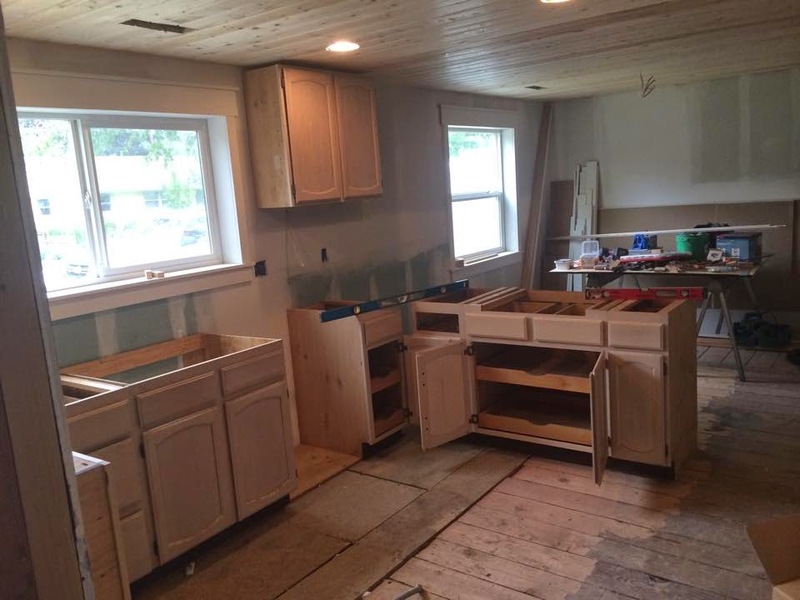 Installing crown moulding, caulking and sanding nail holes and joints then adding all the custom trim work we chose for the kitchen. 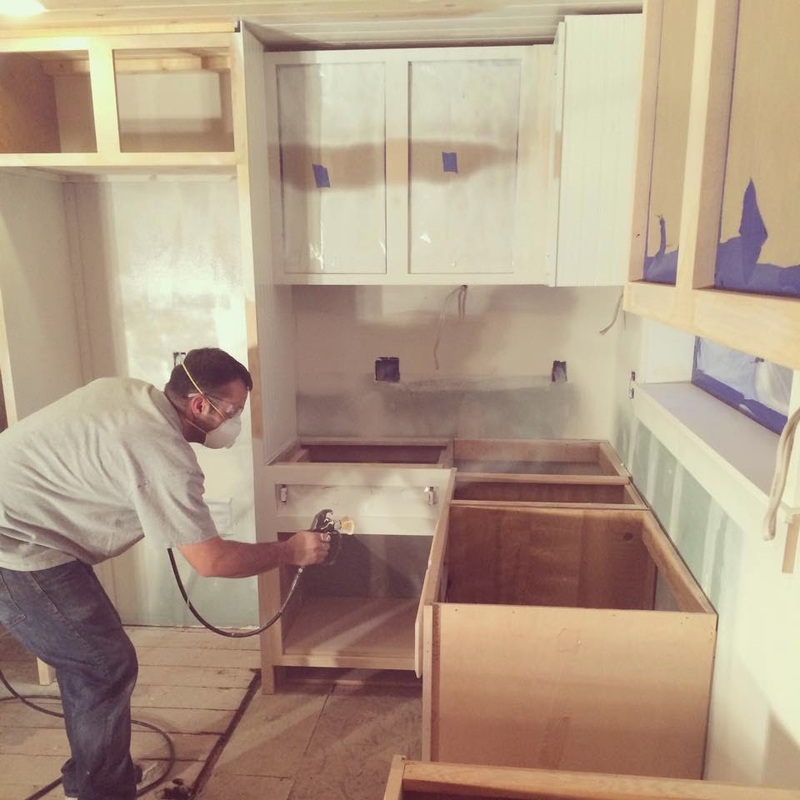 Meanwhile in the back addition of the house (you can see that process here), we set up a paint booth for our cabinet doors and drawers. 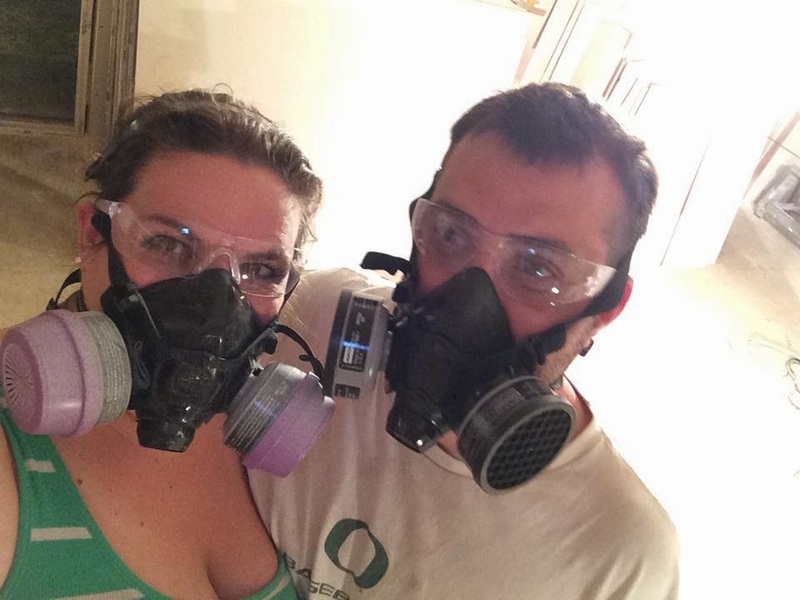 We purchased a Graco paint sprayer from Lowes and let me tell you, it was worth every penny. 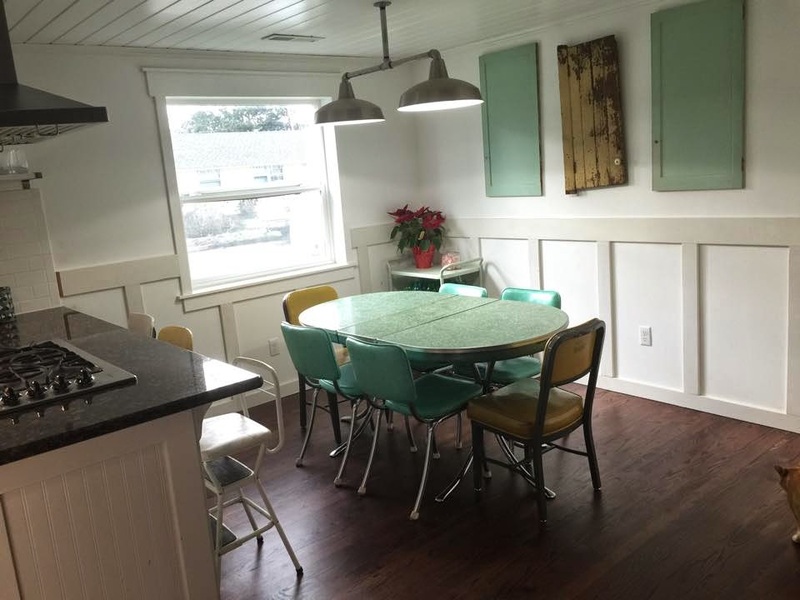 We used a synthetic oil based paint on our cabinets to give it that hard finish, and they turned out amazing. 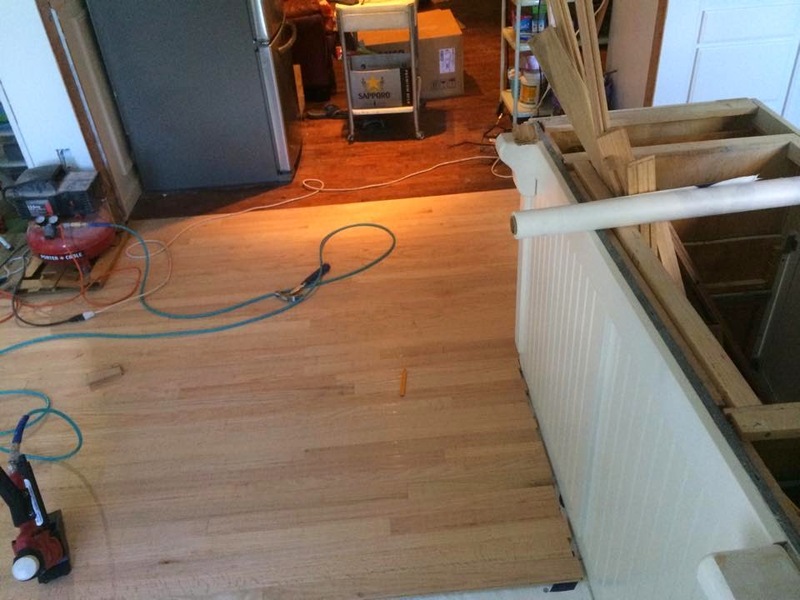 Once the kitchen was painted, it was time to install the flooring. 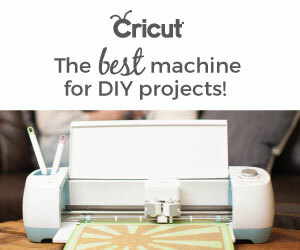 Here is another DIY that many thought we would fail. 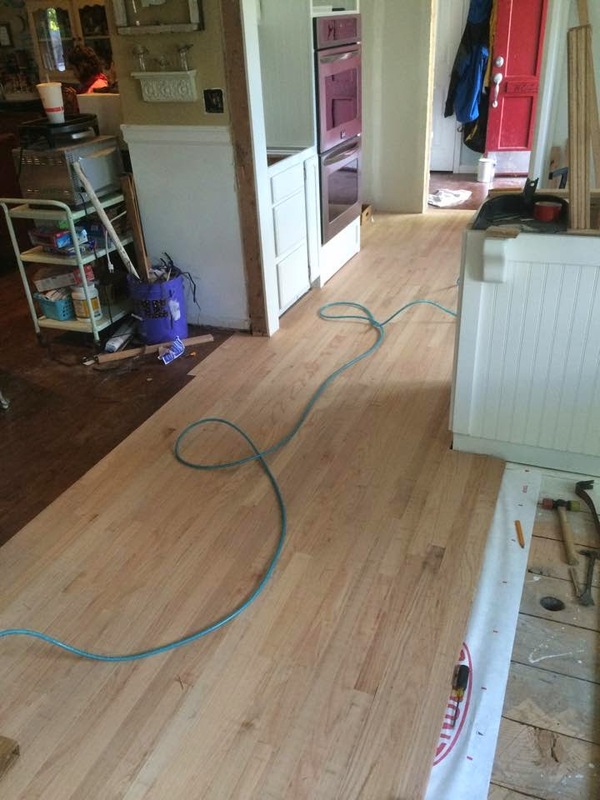 We had previously uncovered the original oak floors and refinished them a year after we moved in. It was quite a process, but they turned out amazing. 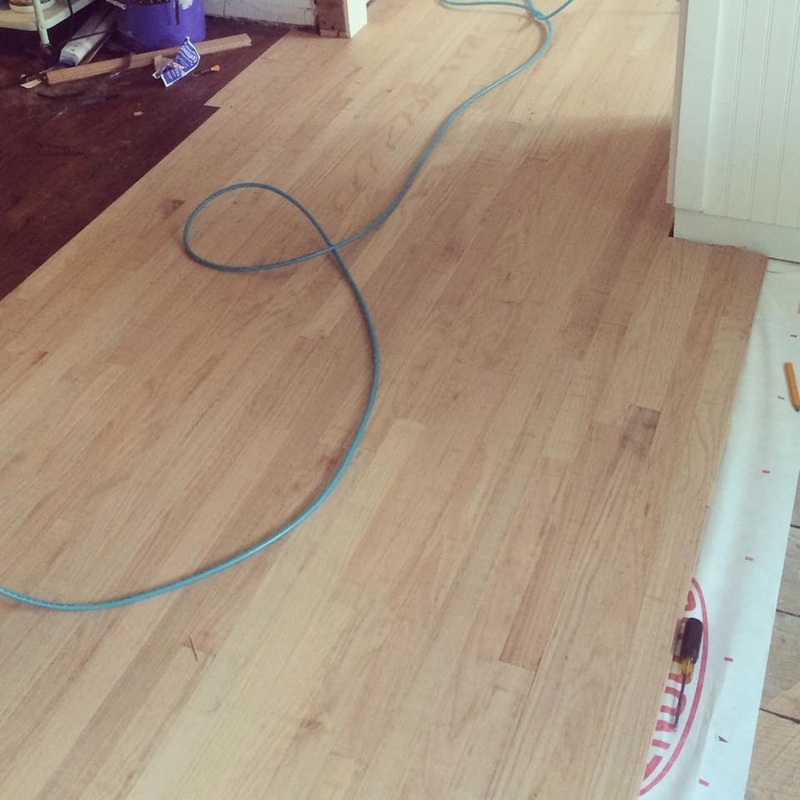 The trick now was buying brand new unfinished oak and making it match the existing floors. 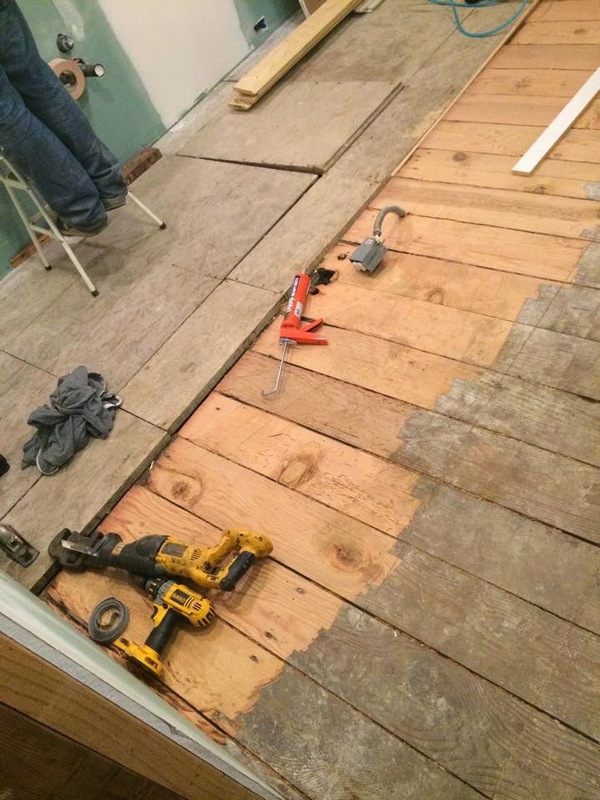 Once all the unfinished oak was installed, we covered it right back up with protective paper until we were ready to refinish the entire house. 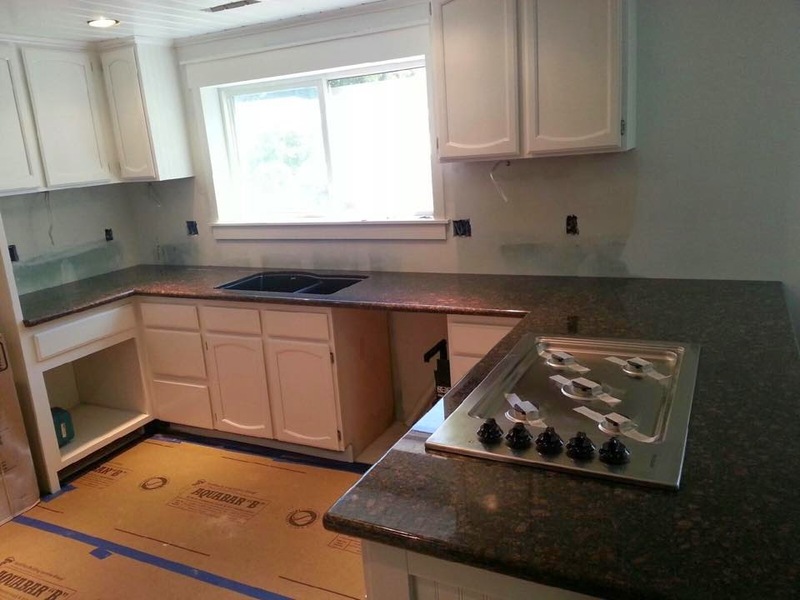 It was then time for the granite guys to install our beloved counter tops! 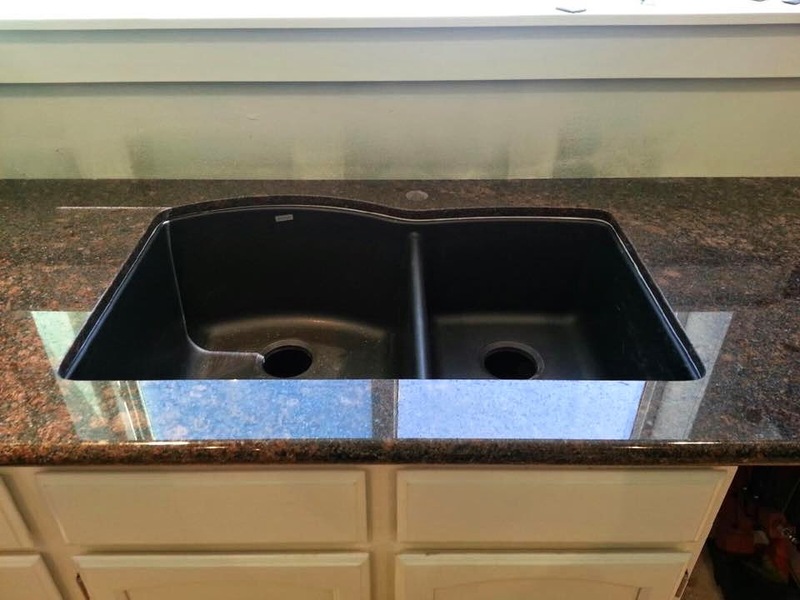 We have great connections in the construction industry and got a steal of a deal on granite slab counter tops. 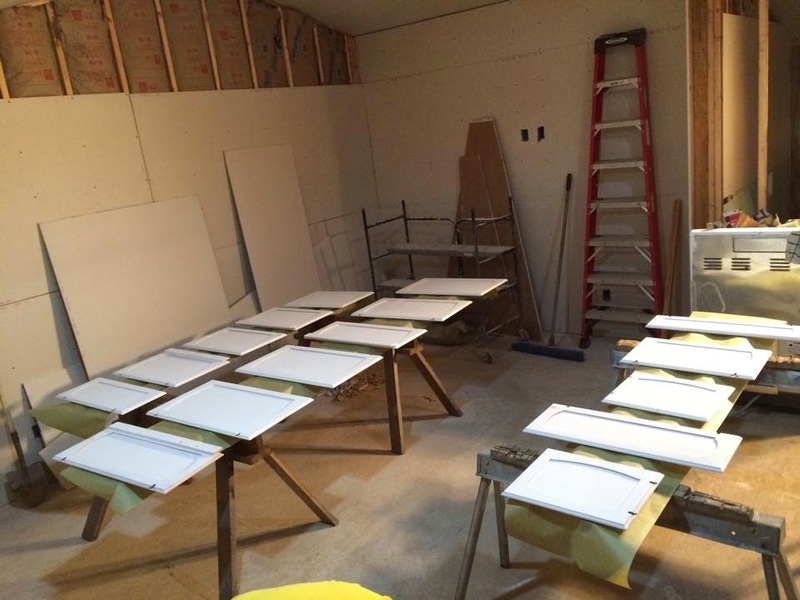 This is the night before they arrived, we created the plywood tops for the slabs to sit on. 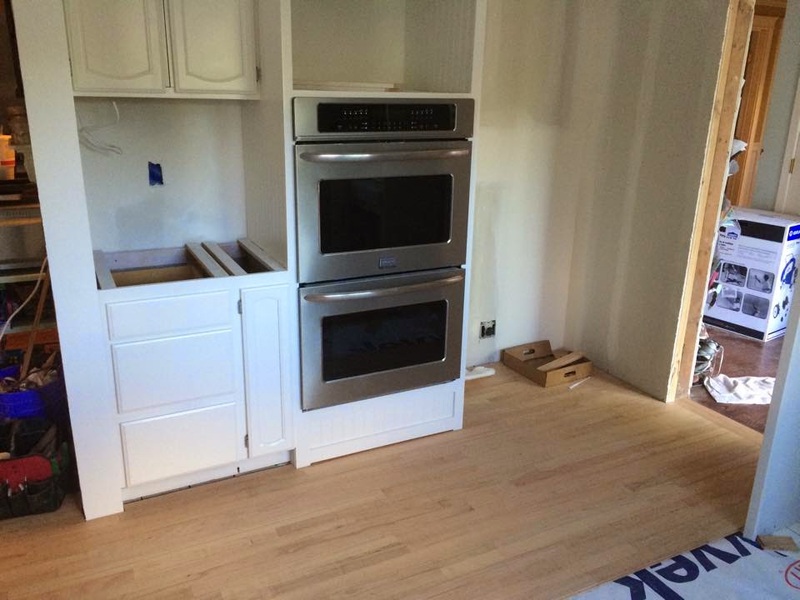 Within a couple hours they had them cut for appliances and sinks and installed. After the counters were installed, we literally packed up and headed out to Pine Idaho to go visit the town my grandfather grew up in. 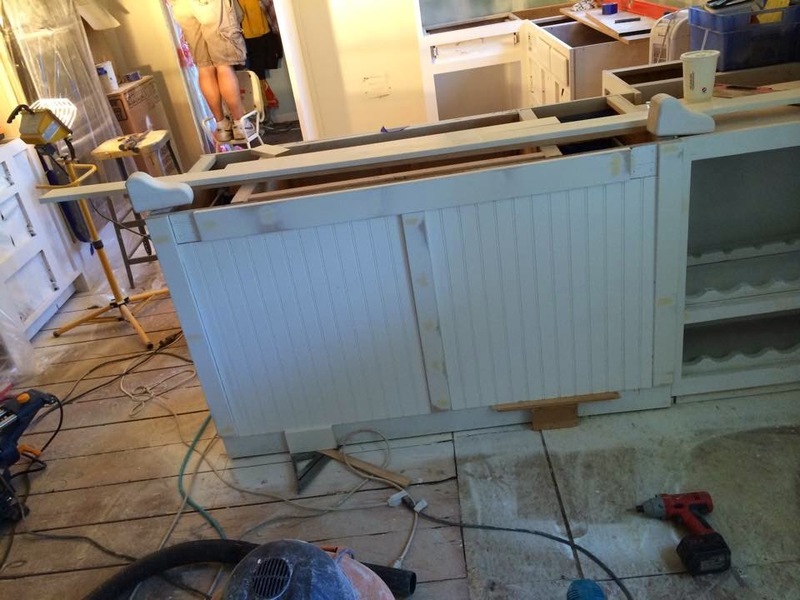 It was a nice break from the DIY madness..
Once we returned it was time to get the back splash installed. 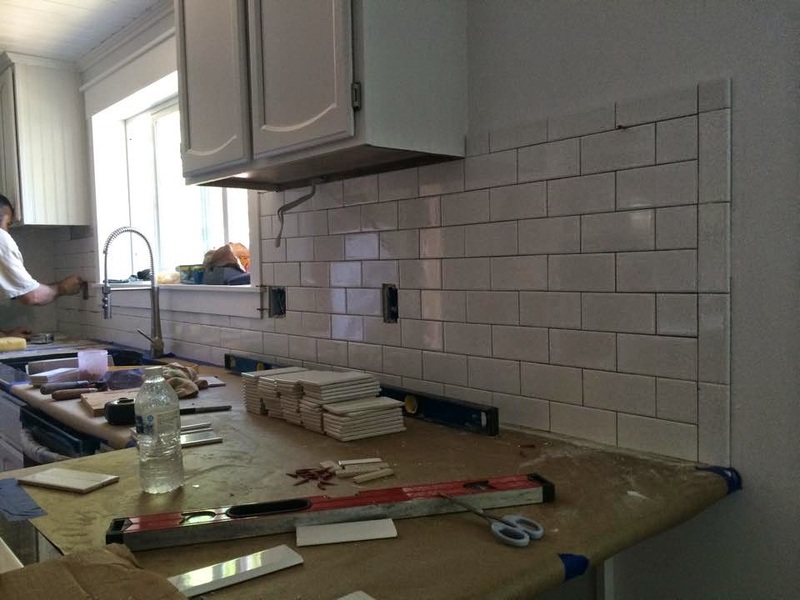 We chose the timeless classic of white subway tile. 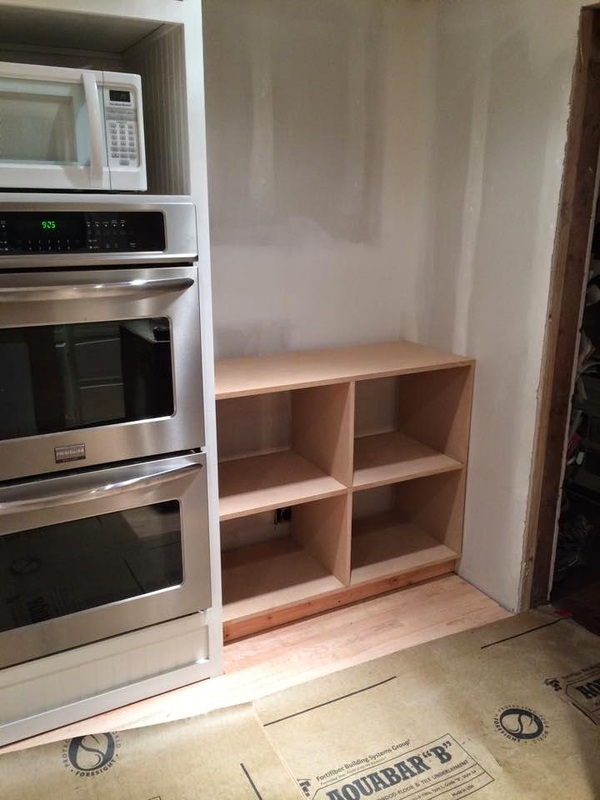 We created a pantry next to our ovens, and again used our new favorite Kreg Jig to build these ourselves. 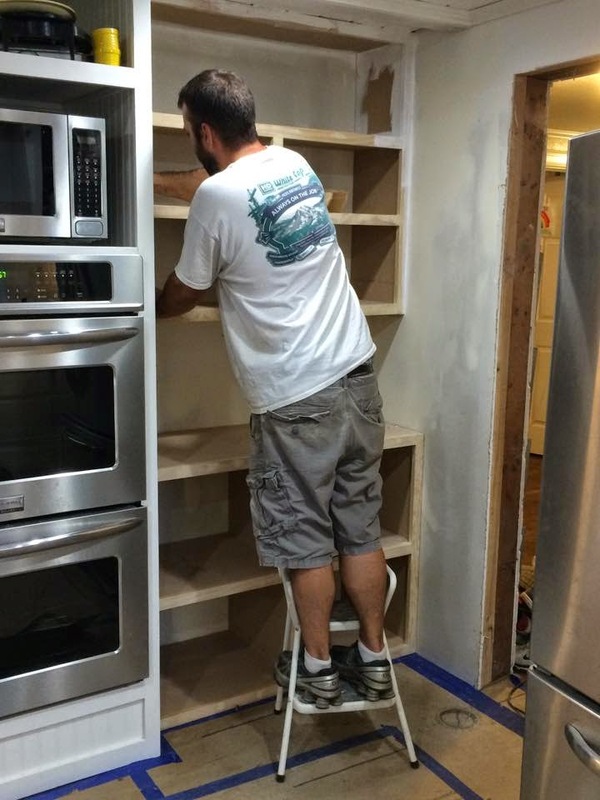 You can read about how we built the pantry here. Simple coat of white paint, and its ready to go! For our dining room light fixture, I could not find exactly what I wanted, so I headed to Home Depot and bought all sorts of pipes and two light fixtures (for $25) and created this beauty. She is exactly what I wanted. The big day had come…. we packed up our entire house (except the kids rooms) and headed to a hotel so that my husband and father in law could refinish 1,500 Sq Ft of oak flooring. This was the biggest and hardest task he has ever done, and if you ask him today, he will never do it again. But this was the end result of his hard work! We could not be happier with the way it turned out, and would do it all over again. We did 95% of the work ourselves and never argued once. 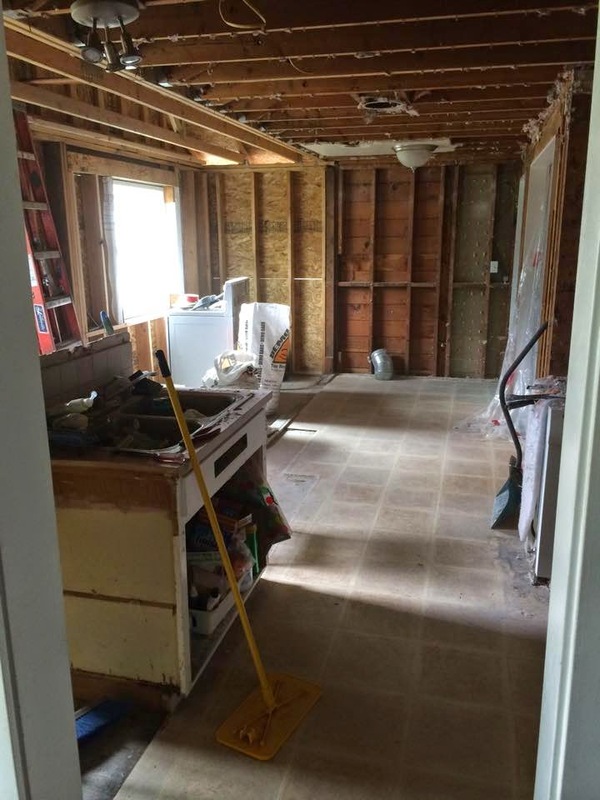 We were told countless times that most home remodels end in divorce….. well not this one! And just for good measure here are some before and afters! Thank you so much for stopping by. What a fun journey this has been. You out did your self again. OUTSTANDING work! Jenn, you are my hero. 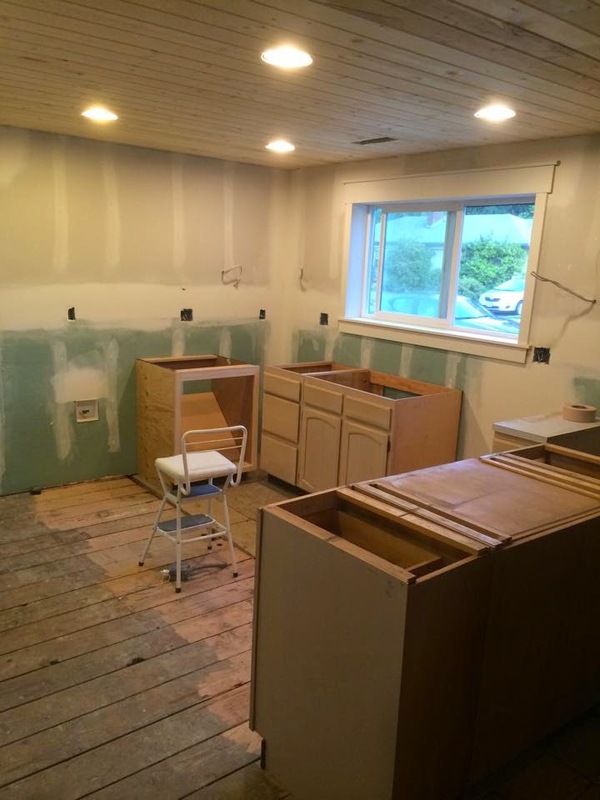 We did a remodel a few years back and it was very stressful. I was the foreman and person who bought all the supplies at the different warehouses and stores. I never had to paint or hammer anything. You rock! you rocked this makeover. Love it. I invite you to share at my Thursday hop ( you can link up through Sat midnight) Hugs! oh.my.gosh! this is amazing! 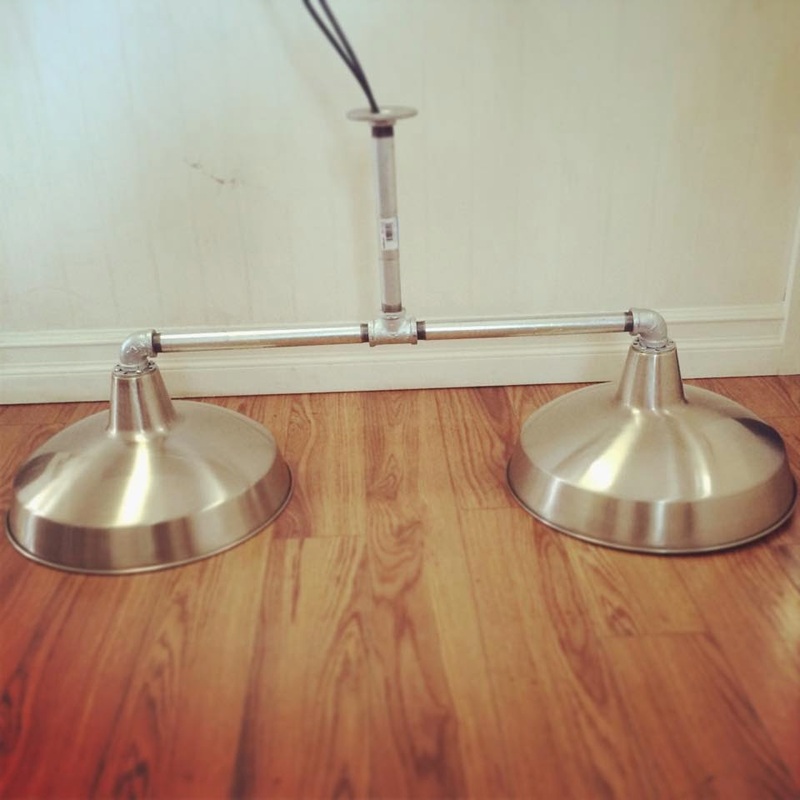 i am super impressed with your light fixture and other diys. we do all the work ourselves, too, so it takes so stinking long. enjoy every second of this kitchen now. Gorgeous! I'm impressed you did this yourself. Great job! 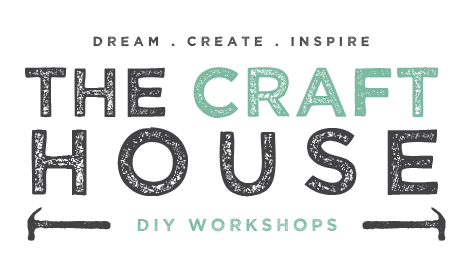 This really IS a DIY dream! What a great job y'all did. 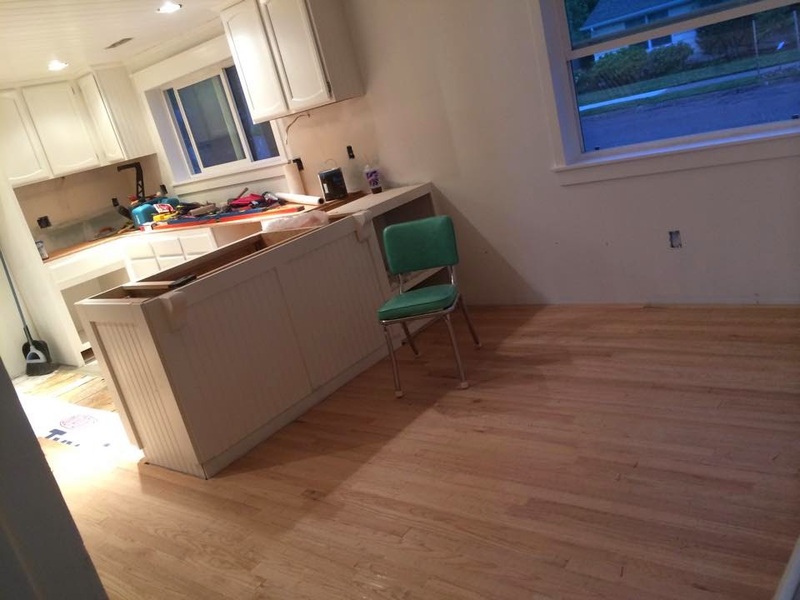 Hope you're enjoying your beautiful new kitchen. 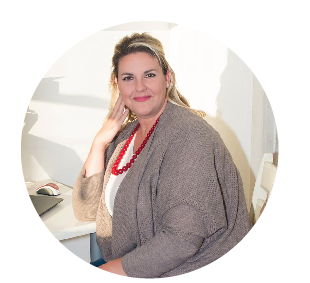 Thanks for sharing this at Grace at Home–I'm featuring you this week! I LOVE this post! Thank you for sharing this! 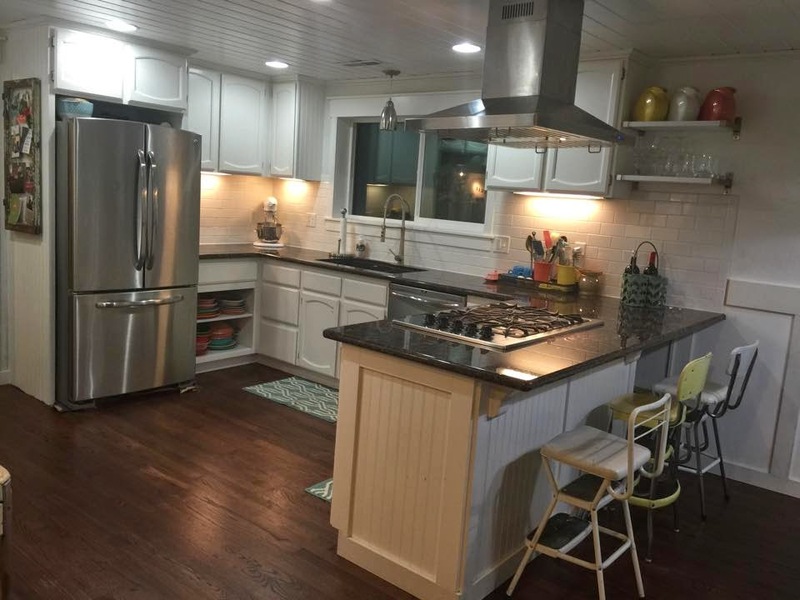 Gives me hope for our future kitchen remodel. I am truly impressed! 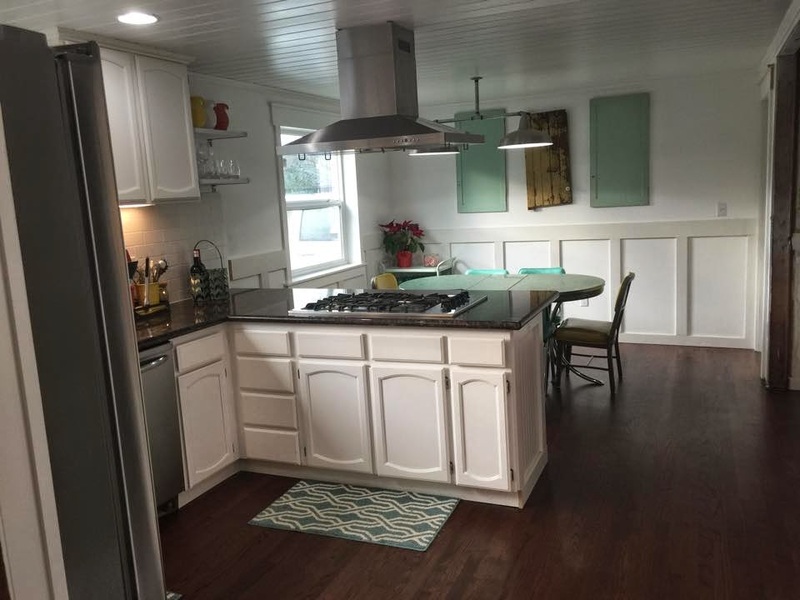 What a gorgeous kitchen and I can't believe the deal you got on those cabinets! Just beautiful! Do you remember what color stain you used on the floor? 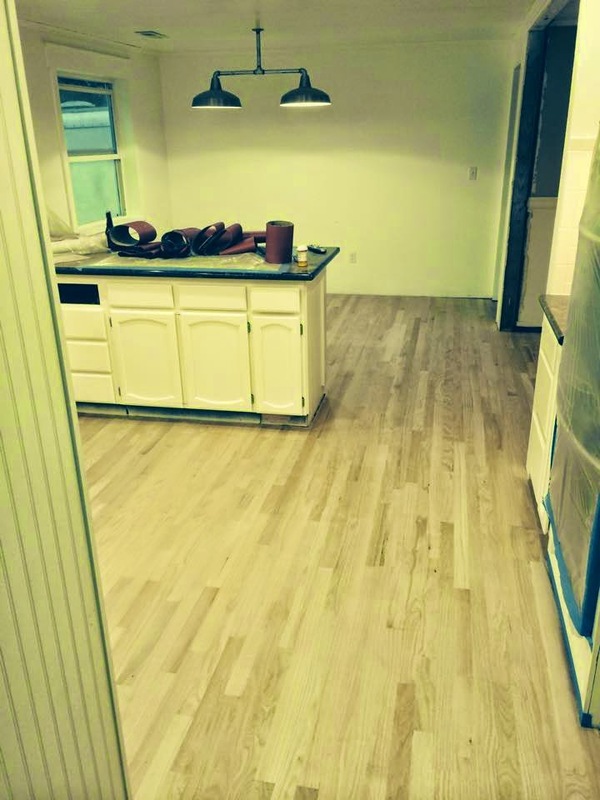 We are putting in finished-on-site red oak in our kitchen and I can't decide on the stain. 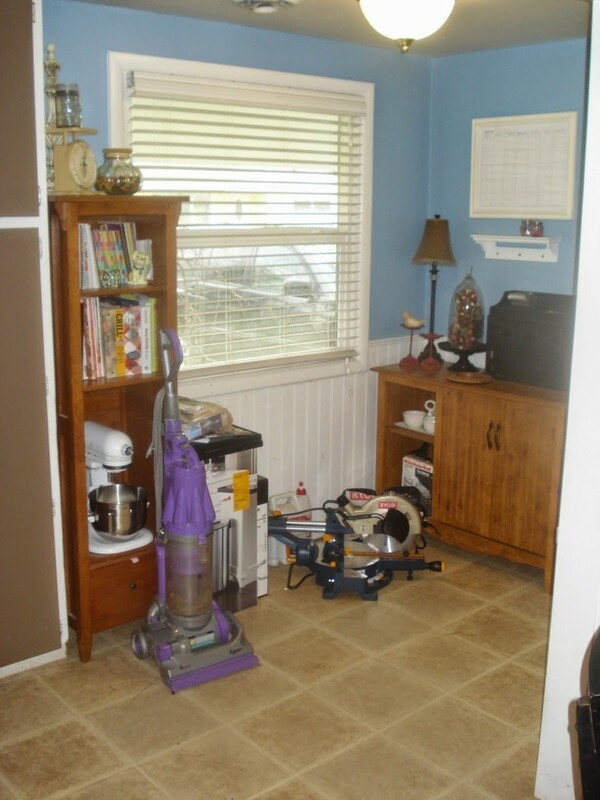 Also – how long did the room smell after the floors were finished? I am dreading that part! Thanks and great job! Wow, Jenn! What an amazing transformation! 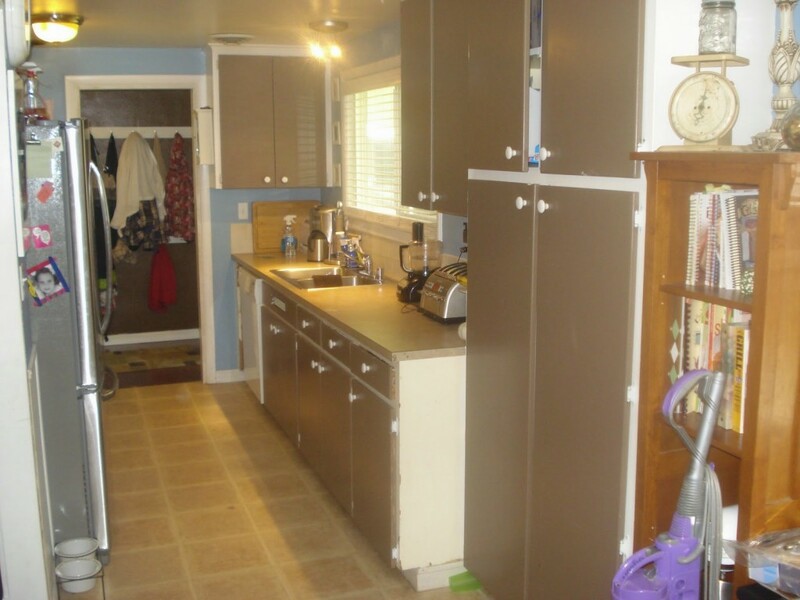 And to pick up those cabinets for that steal if a deal??! 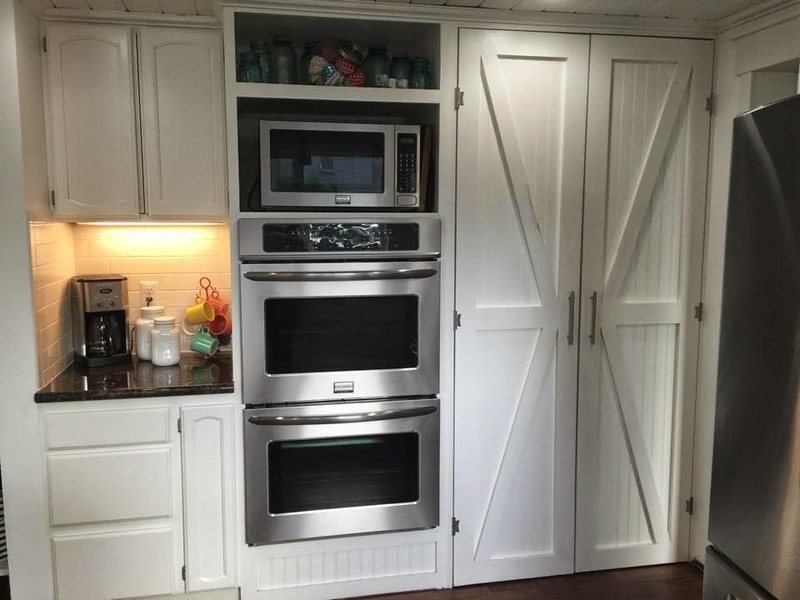 I love your pantry doors especially! 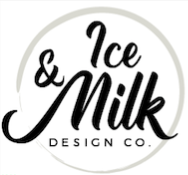 Would be thrilled if you shared it at our link up party on my blog please 🙂 Have a great rest of the week! I love how crisp and clean it looks! Great job! 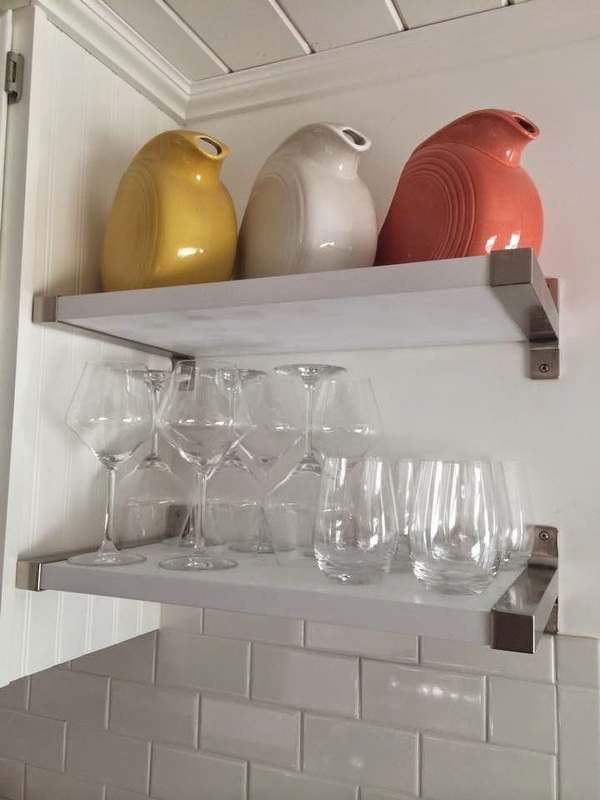 What a find on those cabinets! You guys killed it. So impressed! What an amazing transformation! 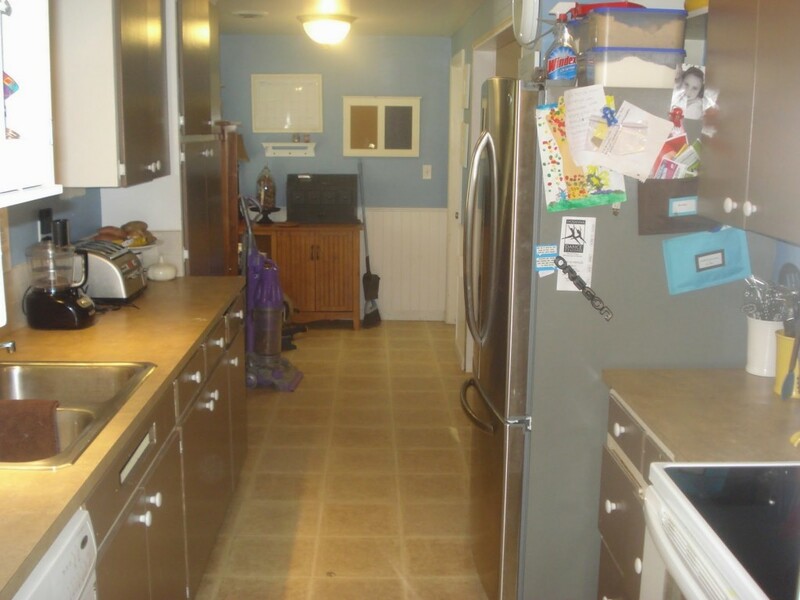 I can't believe your amazing find on the cabinets! That's awesome! Amazing makeover, Jennifer! Thanks SO much for sharing at Your Turn To Shine! You must be thrilled to wrap things up early this year. The transformation is really amazing! 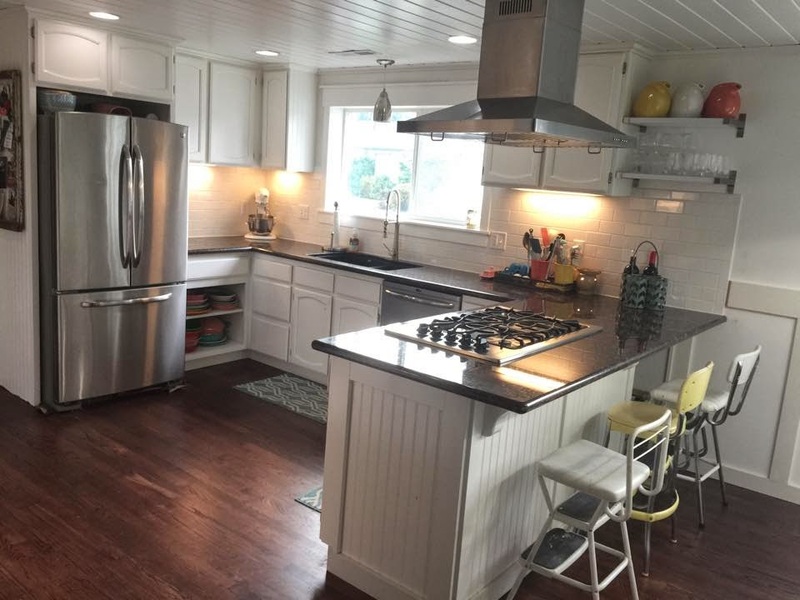 You’ve done an excellent job evolving this place from a plain and homey space to a more chic and modern kitchen. Cheers! Fred Richardson @ SGK Home Solutions, Inc.